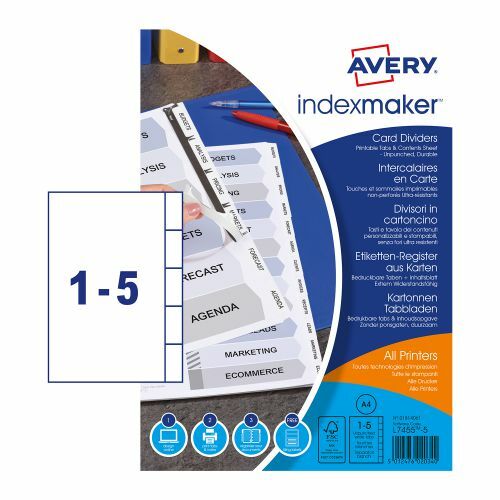 Avery IndexMaker 5Part Unpunched Dividers are the complete, fully customisable indexing solution. Coordinate your documents into sections for extremely quick referencing and customise the tabs to suit your needs. 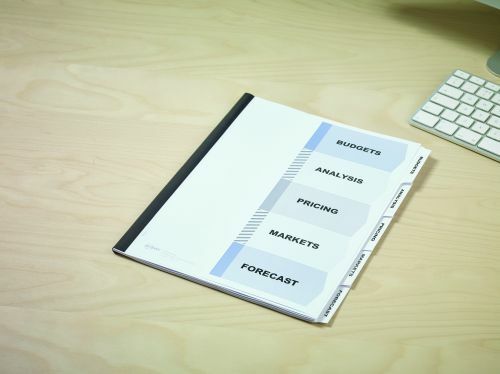 Create professional looking dividers with your PC and laser/inkjet printers. Customise the clear divider tabs with your own printed titles, ideal for impressive looking presentations, proposals and dividers. Each pack comes complete with dividers, clear tab labels and printable contents sheet. Fast, simple and easy to use with pre-set layouts for tab labels and contents sheets in Microsoft Word and other popular software packages. Fast, simple and easy to use with pre-set layouts for tab labels and contents sheets in Microsoft® Word and other popular software packages.